Chris Noyle filmed railways in Britain and Europe from 1962 to 1972. 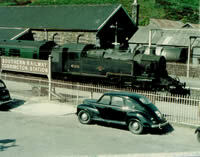 This is the second volume from his collection and features the steam scene in England, Scotland and Wales in the 1960s. 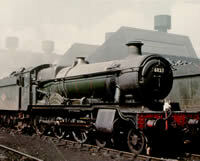 We start in Scotland at Aberdeen and Perth for B1s & A4s including 60016 "Silver King" before views at Derby in 1962 of the last remaining unrebuilt Patriot, 45543 "Home Guard" and of "Clun Castle" on the first part of the Paddington to Gloucester to Birmingham Snow Hill rail tour in 1965. 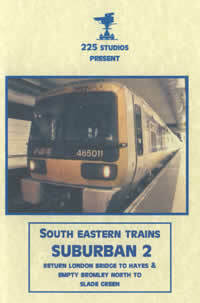 Then onto the Southern in 1967 and a variety of scenes right up to the end of steam at a number of locations including Basingstoke, Guildford and Nine Elms Shed featuring Bulleids, Standards, USA Tanks and even an A4 Pacific! The very last "Bournemouth Belle" Pullman passes by... deliberately diesel hauled! In 1966, Chris went on a rail tour, this time from London to North Wales hauled by Britannia 70004 from Crewe, a pair of Stanier 2-6-4Ts from Llandudno to Blaenau Ffestiniog and a Crab to Denbigh. Another rail tour is Black 5 hauled around the Walsall & Wolverhampton area before going forward via Shrewsbury to Chester with 7029 "Clun Castle" and then returning to Crewe with a former Crosti boilered 9F. The North East Region was of great interest to Chris. There are many scenes in this area before steam finished in September 1967, including at Tyne Dock shed. 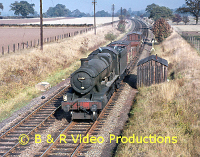 Onto the Midland Region for footage around Carlisle and Leeds in 1966 including a visit to Holbeck Roundhouse and Farnley Junction sheds featuring Britannias and ex-LMS Black Fives. 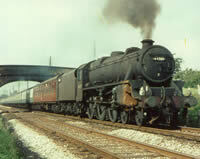 Whilst in the area, Chris also visited Wakefield to see WD 2-8-0s and the other engines there. Finally, back to the North Eastern Region in 1967 for extensive footage of J27s, Q6s (including the now preserved 63395), WDs and K1s hauling coal trains and empties to and from Seaham, Hall Dene and Vane Tempest Collieries. All the archive film used is in colour and an authentic soundtrack has been added along with an extensively researched commentary. Cover photo:- K4 2-6-0 No.62050 on coal empties, 1967.